We have been accepted into the Abrams Dinner Party line up for fall and spring 2018-2019. We are pretty excited to get to extend our skills a bit further into something a little different from our usual dinner parties. With a variety of cookbooks sent to us from Abrams books, we get to explore an endless amount of new recipes and put them into action. 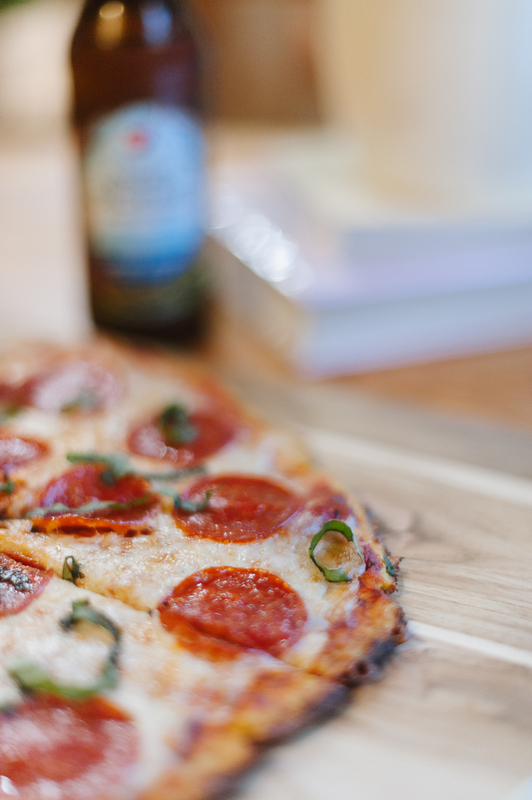 To keep things simple and fun, we amped up our usual weeknight dinner with a cauliflower pepperoni pizza from the marvelous cookbook, Cali’flour Kitchen by Amy Lacey. There are an abundance of fun recipes to transfer any previously loved grain dish into a cauliflower one. It can sound a little weird, but it’s really fun to try. I’m not a full convert here, but there are some great new ways to use cauliflower that I’m looking forward to exploring. In all honesty, the one thing I was looking forward to the most in this cookbook, was different ways to cook cauliflower as a vegetable. I once found this vegetarian cookbook that showed a wide range of unique and fun ways to cook with your average vegetables, and I had that in mind when opening this cookbook. This book, however, is really for those who need to cut carbs, eat leaner, are gluten intolerant, or just want to try something different. I made this pizza crust from a whole cauliflower, nothing frozen or pre-packaged. I once tried a frozen cauliflower crust pizza from the store, and I did not like it. I went into this pretty skeptical, but this pizza turned out pretty good. I do recommend eating it fresh, this isn’t meant to be leftovers. I added 1 tsp of salt and a dash of garlic powder to the crust before the first bake, and that added a depth of flavor that was enjoyable. Also, don’t expect this to be like real pizza. It does have the flavors since you’re using all the same toppings, but the crust is, well, made from cauliflower, not flour. I had a great time sitting down with a hard cider, this tasty pizza, and my currents reads, The Idiot and If On A Winter’s Night A Traveller! Thanks so much Abrams for having us as members for the dinner parties, we’re having so much fun already and look forward to the next one! Be sure to check out the first one we did!